I have to confess – I’ve failed epically in my attempts to make gnocchi from scratch. I always wind up with potato dumplings resembling cotton balls. So, for the time being, I’ll stick to the packaged kind and just dress it up with seasonal ingredients. Here I’ve combined bacon, squash and butter to make make a decadent weeknight meal that is still brimming with vitamins and nutrients. I like prepping my own vegetables, but if you’re in a pinch, you can purchase cubed squash. You also don’t have to use butternut squash – feel free to use the variety of your choice. To add a bit more green, stir in some peas or spinach and omit the bacon to go vegetarian. 2. Toss the squash with a drizzle of olive oil, and a tablespoon of salt and pepper. Spread the squash on a baking sheet and roast until tender – about 30 minutes – turning halfway through. 3. Lightly grease a baking sheet, then lay the bacon flat (you can cover the baking sheet in foil to minimize clean up). Bake until crisp and lightly brown – 15 to 18 minutes. Drain bacon on paper towels, then coarsely chop. 4. While the bacon and squash are cooking, bring a large pot of salted water to a boil over high heat. Cook gnocchi according to instructions on package, then drain and place in a serving bowl. Add in the squash and bacon as they are ready and cover to keep warm. 5. 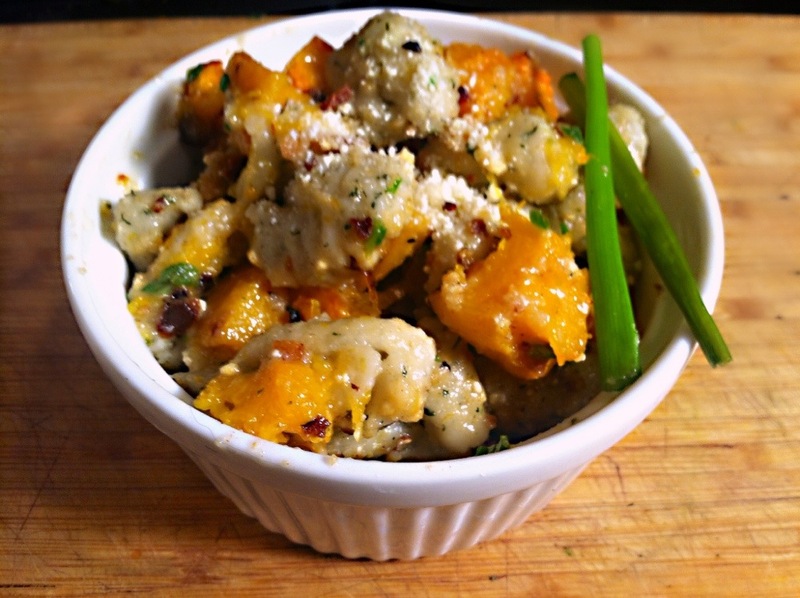 When the bacon, gnocchi and squash are ready, melt the butter over medium heat in a small saucepan. Add the chives and cook until the butter sizzles and begins to brown – about 2 minutes. Remove the pan from heat and season with salt and pepper. Pour the butter sauce over the other ingredients and gently toss to coat. Dish into bowls and serve immediately, sprinkled with cheese. I’ve been too afraid to ever even try to make gnocchi, so you’re ahead of me. This looks quite delicious. I hope you try it! Let me know how it goes!